Cai Lun invented paper like this 1900 years ago. 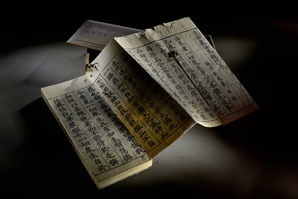 "The Four Great Inventions of Ancient China" refers to paper, gunpowder, printing, and the compass. The idea of the Four Great Inventions was first put forward by British sinologist Dr. Joseph Needham (1900–1995) and is widely accepted by Chinese historians. These four great inventions greatly promoted the development of China’s economy, politics and culture. When these technologies were introduced to the Western countries through various channels, they substantially revolutionized world civilization. Mass printing methods enabled the Reformation and the scientific and industrial revolutions in Europe. Before the emergence of the printing technique, manuscripts were all handwritten by scholars. 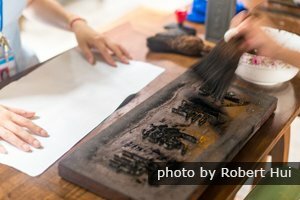 It is known that the block printing technique was used near the end of the Han Empire (206 BC – 220 AD) both for printing on paper and for printing designs on cloth. Bi Sheng (970-1051) is credited with being the inventor of movable type printing in the Song Empire (960–1279). He greatly innovated this important printing method, so he is called the "father of typography." However, the thousands of characters in their written language were not very suitable for being printed with movable type. It isn&apos;t clear exactly how the printing techniques reached Europe. It is known that Uyghers from Xinjiang printed manuscripts during the rule of the Mongols in their empires in the West and in the Yuan Empire (1279–1368). So perhaps they taught the technology to Europeans or perhaps the Mongols or Arabs transmitted it. Once the printing methods reached the West however, when they acquired both paper and a method for mass production of literature, a social and scientific revolution began and large percentages of the populations of many countries became literate and educated. This had never happened before in Europe. Guttenberg invented the printing press about 1450. European alphabets are especially suited for movable type printing since relatively very few letters need to be moulded, and relatively few pieces of type can be reused over and over again. The printing press made printing easier, more rapid and precise. Printed material for educational, religious, and recreational use became commonly available for even the poor in Europe. With their new knowledge, they transformed Western societies, and their general standard of living rose. Major political changes rapidly followed. Before the invention of paper during the Han Dynasty era, the wealthy often wrote on silk. At one time, durable writing materials were scarce and expensive, unwieldy such as clay tablets and rocks, or fragile such as wax and palm leaves. Clay tablets were used in Mesopotamia about 3,100 BC. Papyrus, leather, and plates of wood were also used in the West, and in the Shang Dynasty era (1600–1046 BC), people used bones, silk and bamboo strips, and they inscribed ideas permanently on formal bronze objects. It is said that an official in the Han Empire (206 BC – 220 AD) named Cai Lun invented paper about the year 105 AD. 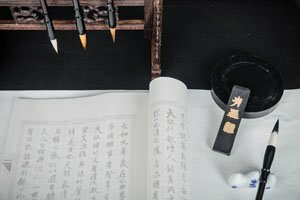 Fragments of early Han paper have been found. The paper was composed of rags and the fibers of trees and plants. To make a sheet of paper, these kinds of substances are repeatedly soaked, pounded, washed, boiled, strained and bleached. The mash was strained in a mesh frame and then dried. The result was good quality writing material that was easier to produce on a large scale. An Arab army acquired paper making technology when they attacked the Tang Empire (618–907) along the Silk Road in the 750s AD. It wasn&apos;t until about 400 years later that paper making technology reached Europe via the Arabs. By the 1400s, paper was commonly produced around Europe, and together with the printing press that was invented in the 1440s, economical mass publishing enabled mass education and the rapid dissemination of ideas. The printing press led to revolutionary social changes. Mass literacy led to the Renaissance, the Reformation that changed the political system, the scientific revolution and industrial revolutions, and the great growth of world population. See more about the transfer of technologies in Why China&apos;s Silk Road Is So Significant. 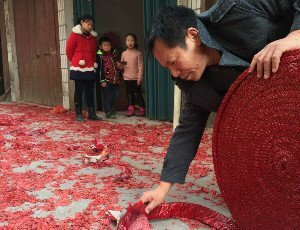 A huge roll of firecrackers: Firecrackers are a very popular use of gunpowder in China. Gunpowder is a mixture of charcoal, saltpeter and sulfur. This mixture was invented and gradually improved by Chinese alchemists in the Tang Empire (618–907). It is thought that the alchemists discovered gunpowders&apos; explosive properties while trying to concoct life extending substances. The people of the Song Empire (960–1279) and adjacent empires used gunpowder extensively during the 1200s. They innovated gunpowder technology sufficiently to be able to construct a variety of weapons by using different formulas such as rockets, primitive guns, small cannons, incendiary devices, chemical weapons, bombs, grenades, landmines, and smoke-making devices for camouflage. They also made fireworks and blasting powder for mining applications. The Mongol army and traders introduced gunpowder technology to Europeans when they invaded Europe in the 1240s. The use of gunpowder substantially changed warfare, governments, and political boundaries. The gun enabled lightly trained infantry armed with muskets to more easily kill heavily armored knights for example, and big cannons were able to destroy the strong fortifications all around Europe that were built before gunpowder was known. With big cannons, Turks were able to destroy Constantinople. Before the use of compasses, people could tell directions from the position of the sun, moon and stars and the orientation of plants. Knowing direction is important when traveling, and if there is cloud cover or fog, traveling is difficult in unfamiliar territory and over open water. It is thought that American tribes such as the Olmecs and others cultures around the world may have used natural magnetite even 3,000 years ago. It is possible that the Yellow River basin, during the time of the Xia Dynasty (2070–1600 BC), compasses were already in use. It is recorded that Huangdi defeated an enemy army by using a southward-pointing cart that helped him know their position so that he could lead his army to them during a major battle near Beijing in the fog. However, scholars debate about whether this story was a myth, how this cart was designed or whether it actually incorporated a magnet at all. It is known that during the early Han Dynasty, people commonly aligned their houses and practiced fengshui by using compasses. Later, especially in the Song Dynasty era, great progress was made in compass making. It was useful for sea exploration and navigation and stimulated the development of their shipping industry. Though there is evidence that the Vikings used compasses for navigation well before 1000 AD, it was a closely guarded secret. It isn&apos;t clear how the rest of Europe acquired the invention. Perhaps other Europeans also used compasses, but they kept the technology secret too. But it is known that by the 1100s, Europeans generally knew about compasses. Scholars debate about how the technology was acquired in Europe. The impact for Europe was great. Using the compass, Europeans began long-distance exploration and acquired more technology from around the world and great wealth. 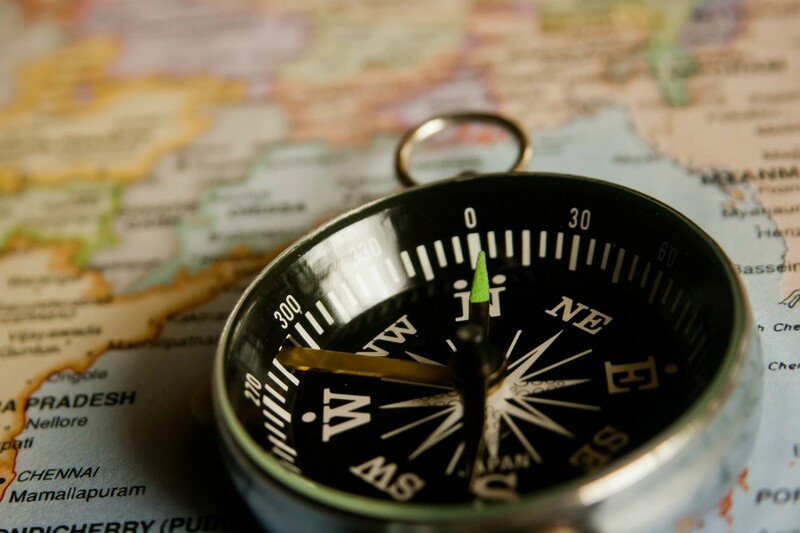 The compass enabled Europeans to discover America, carry on trade in Asia, and travel around the world. Other important inventions were created, but these are not listed among the most important four. Most notable of these for world benefit and the development of the economies of the various empires were silk and porcelain. 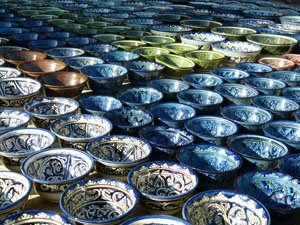 They were valuable trading goods traded along the Silk Road routes, and when the methods for making these products were learned in Europe and the Islamic world, big industries developed in both areas. To learn more about technology transfer along the Silk Road, see What Was Traded on China&apos;s Silk Road and Why. 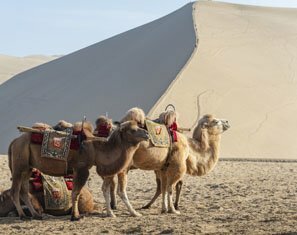 You can enjoy riding in a caravan train like a Silk Road trader in Dunhuang. 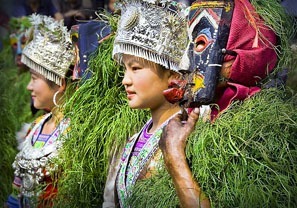 Today China is a mix of ancient culture and modern technologies existing side by side. You can go with us to take a tour to discover the history and culture of China. Along the Great Silk Road — Our 11-Day Xi&apos;an, Zhangye, Dunhuang, Turpan, Urumqi, and Kashgar tour is the most selected Silk Road itinerary. 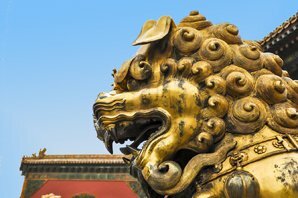 The Golden Triangle — 8 Days in Beijing, Xi&apos;an, and Shanghai. 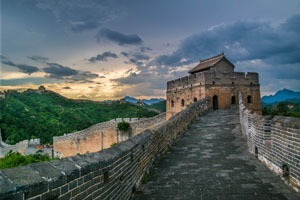 For something different, we would be glad to tailor-make a China tour for you. 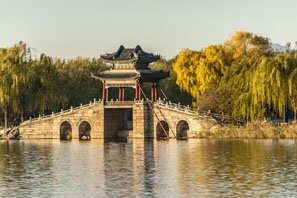 Chinese Wooden Architecture: Why Wood Was Used and How — The Ancient Chinese also innovated a distinctive and practical wooden architecture style.